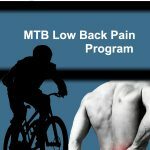 Low back pain is a common problem with mountain bikers. Here is a simple 5 exercise routine I use to loosen up the hips and upper back so that the body can move freely at the hips and take the stress off the lower back. If you currently have low back pain try doing this routine daily for a couple weeks, at which point you can cut back to once or twice a week for maintenance. This routine makes a great warm up for strength training, especially if you have deadlifts or swings in your workout. Hey James — the video doesn’t quite match the list below it. Are the mobs the part right after the frog? When you list arm bar, do you mean the plank? Yeah, I think I changed the routine up when I went to film it because I realized that it was going to take too long to shoot. The printed routine and the video routine are both great, try them both.